Let’s go Tex-Mex today! It’s simply delicious…fresh..and irresistible! 😁 Crunchy Tacos have to top my list when I’m at Taco Bell or Chiles. Vegetarian or Non – Vegetarian, they are all so good! I have made them at home a few times earlier..and they are a delight. Easy to do, fun to eat! I’m a happy soul. 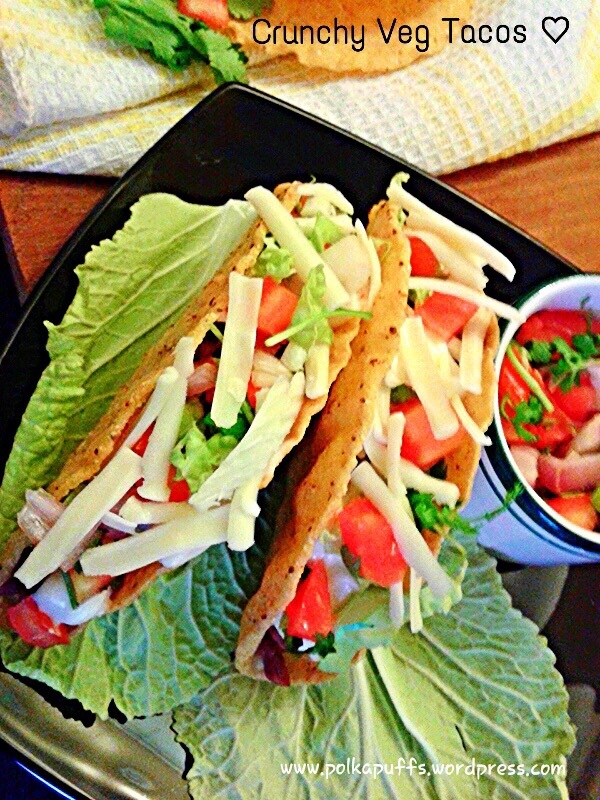 My hubby enjoys them too and says ‘they taste like the ones from Taco Bell’! That’s something!! 😘😘 I paired them with my Iced Green Tea Limeade and our tummies were full ☺️ Nom Nom! Heat oil in the wok, add chopped garlic and green chillies. Sauté for 2 mins. Next, tip in the chopped onions and cook until they turn translucent. Once that’s done, add chopped coriander leaves & tomatoes. Season with salt, taco seasoning & chilly flakes. Cook until the oil separates from the mix. Then add the boiled / canned kidney beans. Stir everything well and cook for about 4-5 mins. Turn off the flame. Add lemon juice and the filling is done. Spread the shells carefully on the baking tray without any grease and heat them for 3-4 min @130’c. Once done, let them sit in the warm oven until every last detail is prepped for serving them. We have heated the shells just to make them crunchy. Mix the cubed tomatoes, chopped onions & coriander leaves and set aside. 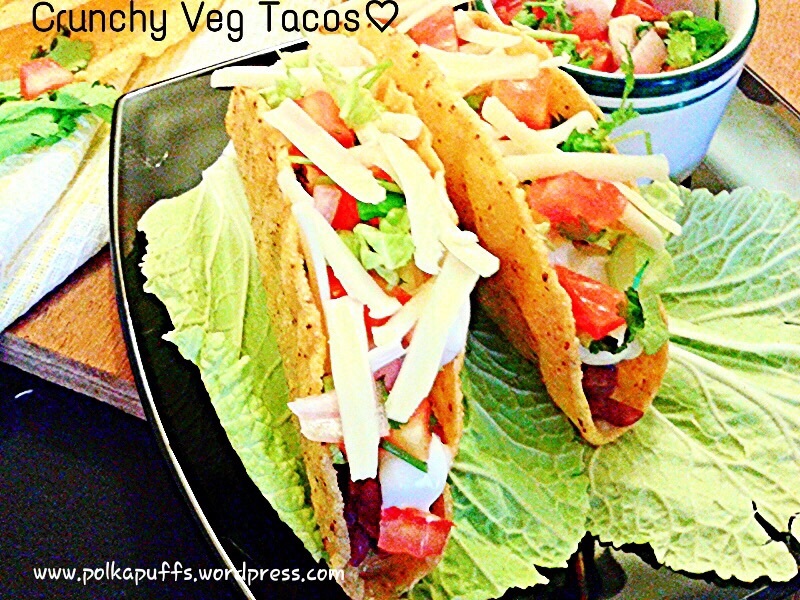 Take a crunchy taco shell, spoon in some of the bean filling carefully…do not break the shells while filling them. Next add some sour cream over the beans filling, sprinkle some salsa and some torn lettuce leaves. And end it with some grated cheddar cheese! That’s it! Serve these immediately before they go soggy and moist! I believe in keeping myself hydrated ..especially in these relentless summers! I keep on drinking water and somehow I end up feeling even more thirsty. I am sure it happens to all of us out there. Green Tea is a regular feature in my household…its loaded with health benefits..keeps you energetic while it flushes out all the toxins! What better could one ask for?! 👌I am no dietitian…so I don’t exactly know how much does it help in weight loss..but have heard people saying it aids weight loss. 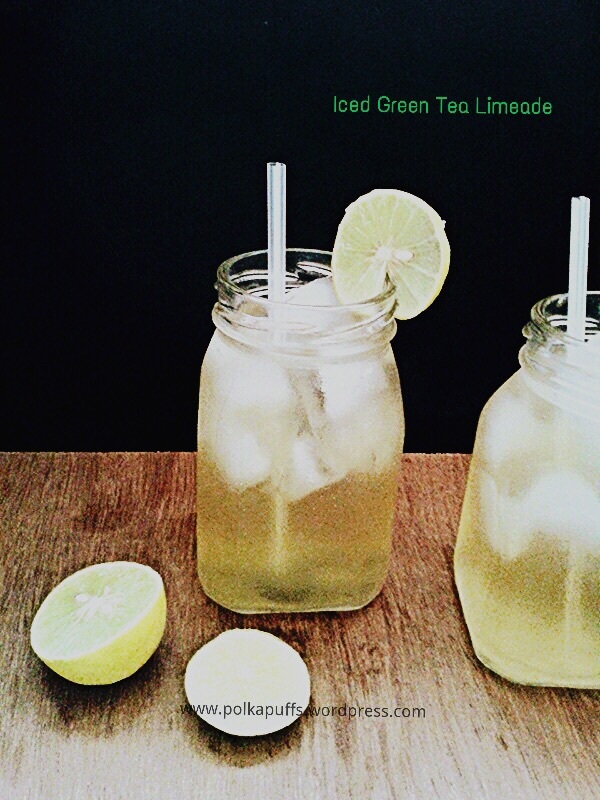 We usually have a cup or two in a day..not more as we have it as a refreshing drink. Equipment: a sauce pan, a strainer, a stirrer, measuring cups / spoons, a knife, a grater. In the saucepan, boil water, mint leaves, crushed fennel seeds & lemon zest (use the grater to zest the lemons) and sugar (if using) until the sugar dissolves. If you are not using sugar, then boil the water with all the other ingredients for 5-7 mins and remove from heat. Dip the tea bags into the water for 10-12 mins. Remove the tea bags. Let the warm concoction sit until it comes to room temperature. Strain the concoction into a jug or a large bowl to eliminate the residue from the mint leaves, fennel seeds & the lemon zest, add the honey to taste and the lemon juice. Stir well. Chill the tea for 2-3 hours. It’s done! 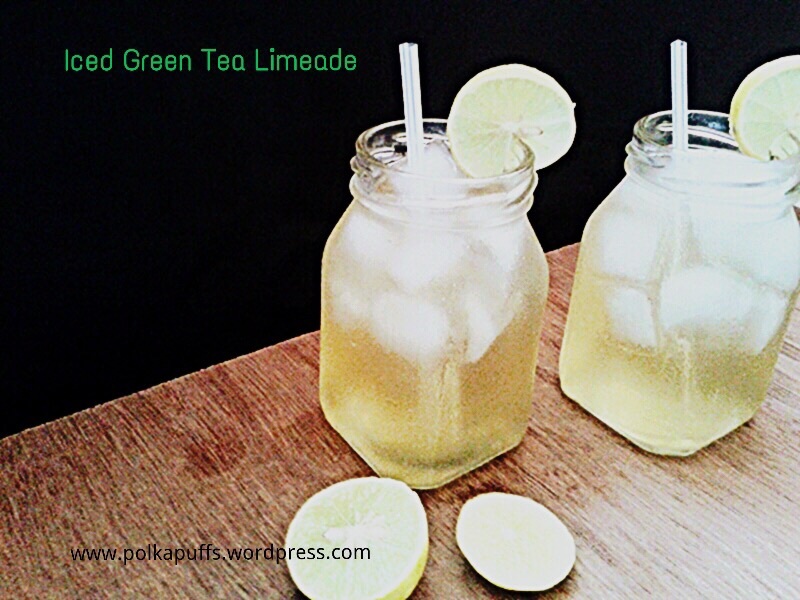 Simply pour over ice cubes in your favourite glasses and serve!! Summers or no summers …I can’t resist a Popsicle!! I enjoy my Popsicles even in the winters… So how could I ever miss out them in these hot days 😉 LoL! I like all kinds of Popsicles..except the milky/yogurt based ones…don’t know why, but I don’t really care for those much. Kulfis are a different story altogether …I adore them☺️…but we’ll discuss that some other time! Now…Mangoes! It’s raining mangoes everywhere! And I love my Alphonso so much…no summer’s ever complete without it… There are many variants out there when it comes to mangoes…but I usually don’t like any other variant 😬 Anyways, that’s me! I am sure there are many Alphonso lovers out there..! Like each year, I made aam-ras to go with Puris and Parathas. Wow! Had so much fun devouring that! Then came the good, old mango milkshake…yup enjoyed too many glasses..have lost count! 😉 But Popsicles! Ya..now that I wanted to do! 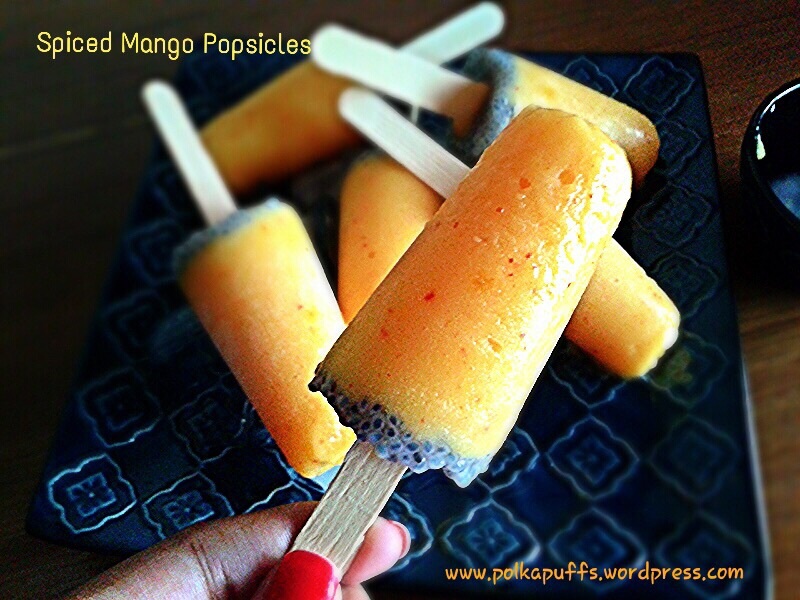 Wanted to do a twist on the classic Mango Popsicles ! And twist I did..it’s easy, quick and oh so yummy! 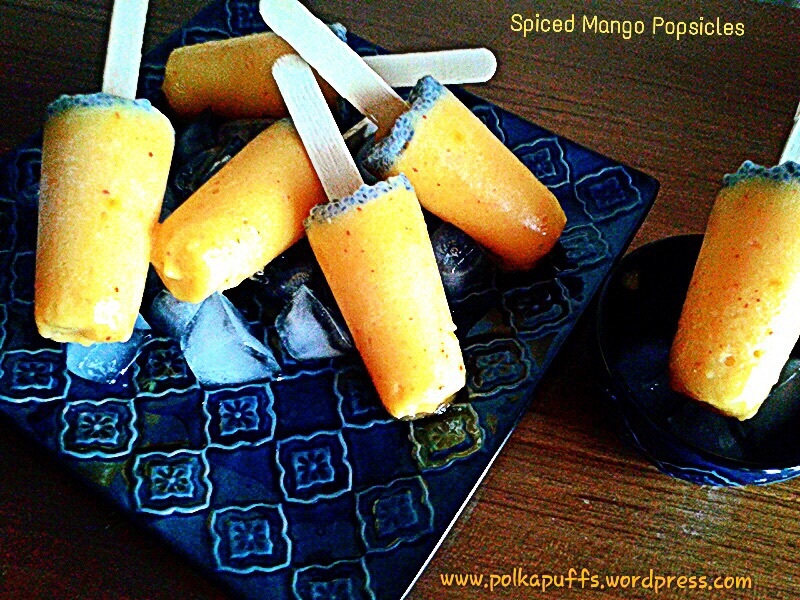 It’s a mildly Spiced Mango Popsicle! I have used some exciting flavours to give it that bit of warmth will take you by surprise between icy cool licks! 😛😛😛 the Mr. & I ..we both liked it and I am gonna be making another batch soon! Are you ready to get yours started?! 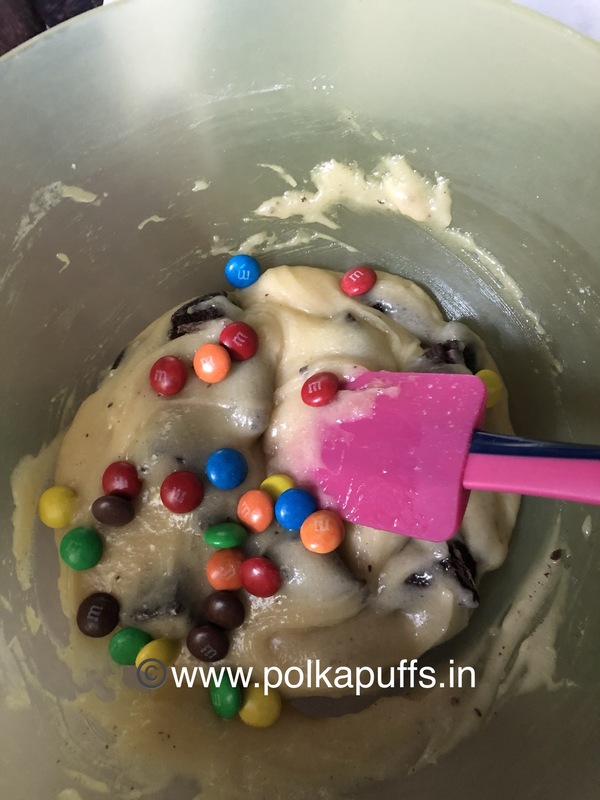 Well, here’s the easy – peasy recipe..
Equipment: a mixing bowl, Popsicle moulds. 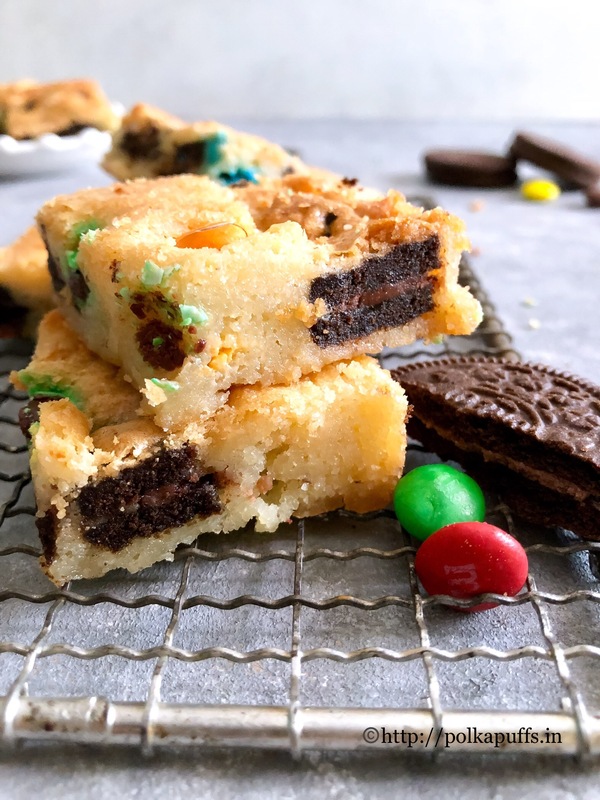 Loaded Oreo & M&M Squares should be your go to dessert if you are an Oreo lover!! You’ll not give these a second thought before you give them a go! These are really easy to whip up and taste absolutely yummy, gooey & super fudgy. All that in about 45 minutes!! 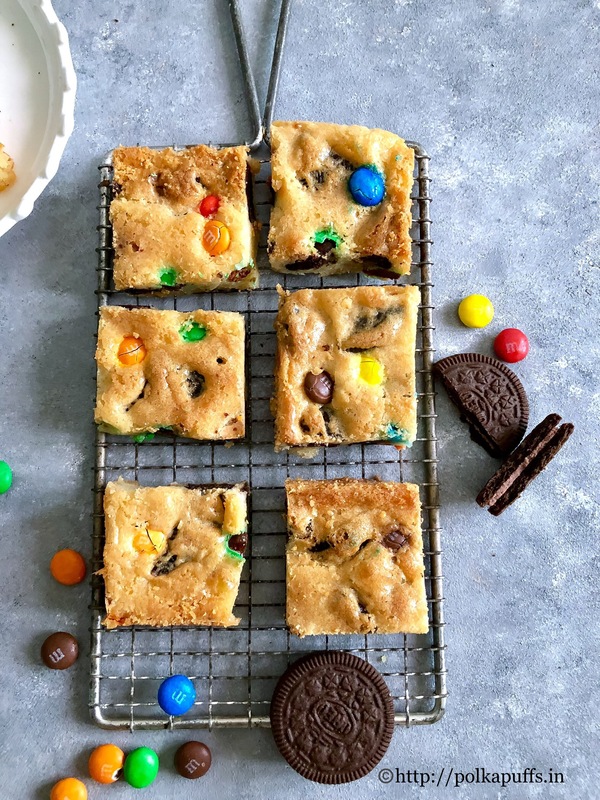 Loaded Oreo & M&M Squares are made with just some leftover Oreos, a large pack of M&Ms and a few other ingredients easily available in the pantry 🙂 This recipe needs no beating or whipping, so easy that even kids could manage these. And let’s not forget, kids love munching on these. Serve it to them with a glass of chilled / warm milk or their favorite ice-cream shake! Loaded Oreo & M&M Squares taste better than they probably sound. They have a gooey, melt the mouth yet firm texture which is absolutely addictive, if I must say so myself! The man and I, we love these Loaded Oreo & M&M Squares and I literally have to hide a few for myself, lol!! 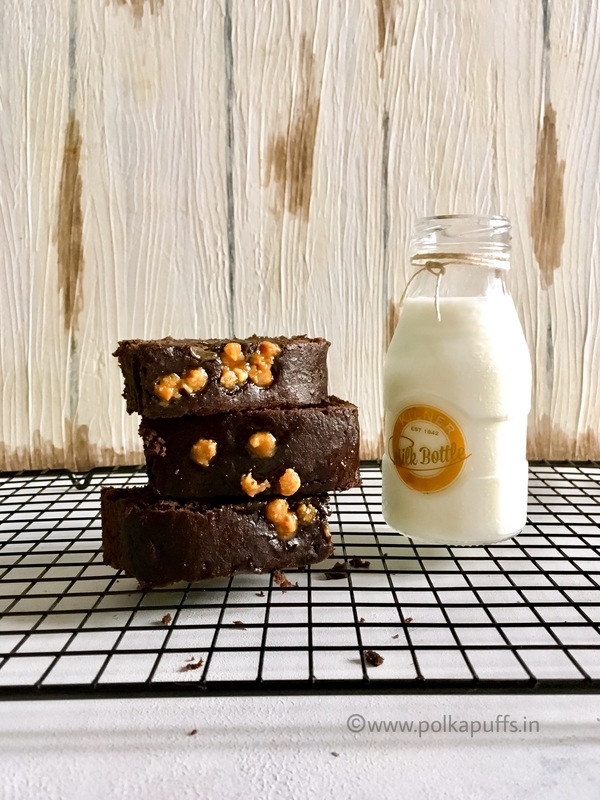 Almost makes me forget my Whole-wheat Fudge brownies 😉 which are eggless if you must know. Totally drool worthy! 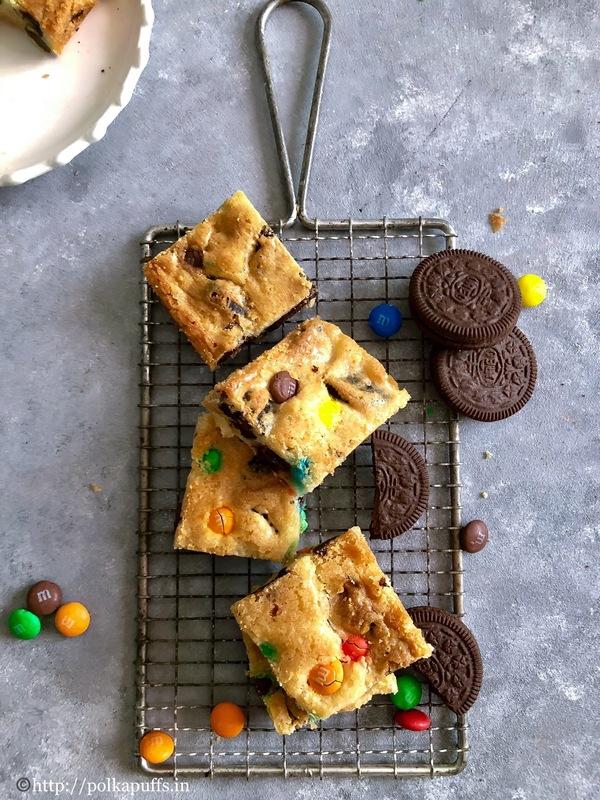 But if you try these Loaded Oreo & M&M Squares, you’ll probably love them more than a brownie. Take that from me! 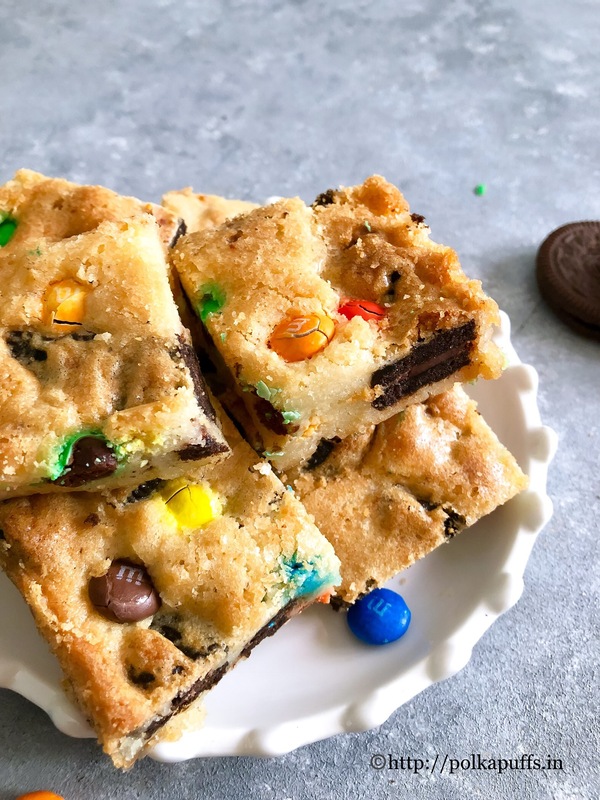 Loaded Oreo & M&M Squares are perfect for game night treats or a school bake sale, perhaps for edible gifting too??!! I’ve served these slightly warm with some Vanilla Ice Cream, that makes for a scrumptious dessert. One can pair them with any ice cream of your choice but vanilla seems to work the best for me 🙂 Anyways, let’s go forward with this recipe. Preheat the oven @ 180′ C.
Line a 8″X 8″square baking tin with parchment paper and let some of the paper flow out of the tin on all four sides. It’s easier to unmould the squares later this way. Grease the parchment paper with some butter. Use the large microwave safe bowl and melt the butter in the microwave at high for about 40-50 secs. 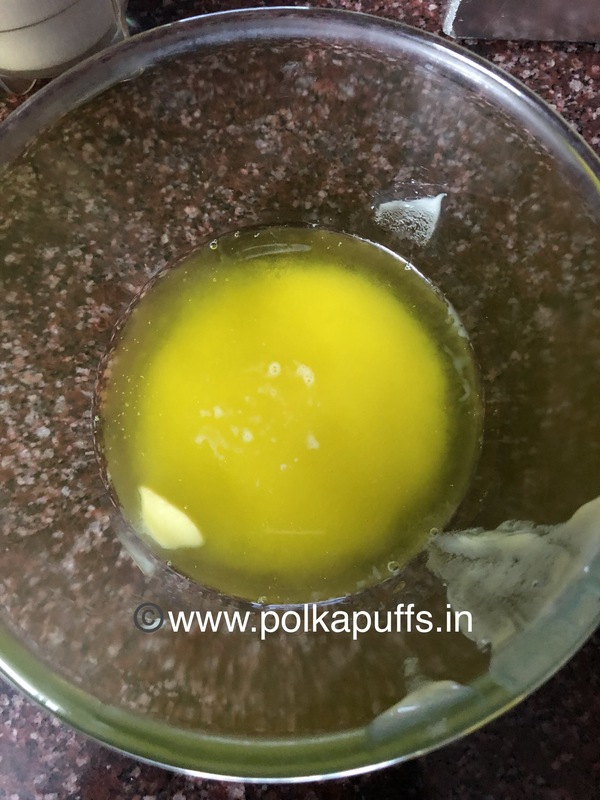 Let the butter sit for 5 mins before you add the egg, else the egg will simply scramble. After 5 mins, add the egg and sugar to the melted butter and mix it well. Add the vanilla extract to it and mix well. Now add the flour to the egg & butter mixture and stir until well combined. Don’t over-stir the mixture. Next, add the chopped cookies along with a few MnMs and stir everything well. Pour the batter into the prepared baking tin and flatten using a spatula. Next sprinkle the remaining M&Ms on top of the batter and press very slightly to set everything well. Bake for about 25-30 mins. When it’s ready, the edges should be slightly brown and the top should be set. Do a toothpick test, the toothpick if entered in the center, should come out clean or with a few moist crumbs. But no sticky batter. Allow the squares to rest in the tin for at least 30 mins on the cooling rack before you slice and serve. Enjoy these squares, either warm or cold. They keep up to a week when stored in an airtight container. You can freeze them too for over 30 days. 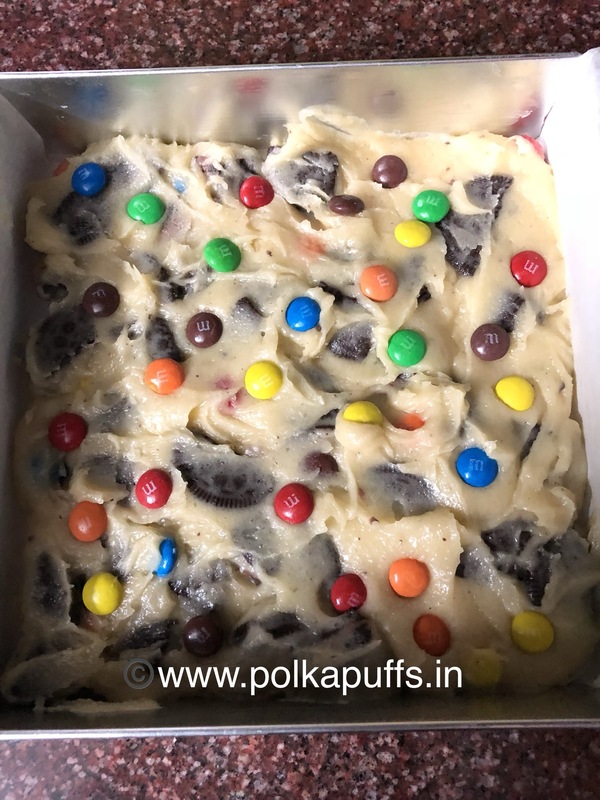 Gooey, yummy and slightly chewy, these Oreo and MnM squares are so scrumptious. They don't call for too many ingredients and come together in a breeze. Preheat the oven @ 180' C.
Line a 8"X 8"square baking tin with parchment paper and let some of the paper flow out of the tin on all four sides. It's easier to unmould the squares later this way. Grease the parchment paper with some butter. Now add the flour to the egg & butter mixture and stir until well combined. Don't over-stir the mixture. Bake for about 25-30 mins. When it's ready, the edges should be slightly brown and the top should be set. Use Cadbury Gems if MnM is not available. This recipe doesn't need baking powder and baking soda. Chocolicious Banana & Butterscotch Breakfast Bars! 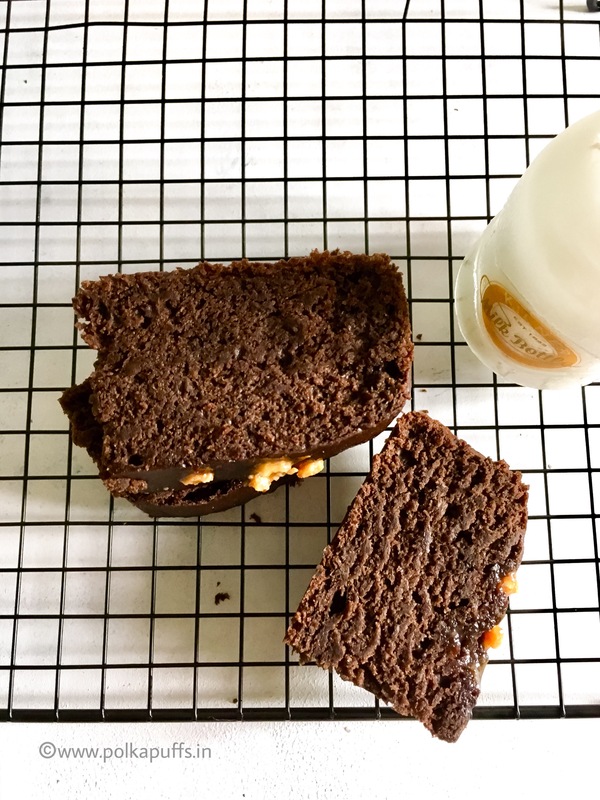 Chocolicious Banana & Butterscotch Breakfast Bars are healthy, though they have a chocolate quotient, like all my cakes do, but these are vegan (no eggs-milk-butter) and made with whole wheat flour. Sounds healthy?! Besides, this recipe is a really great way to use up all the browning bananas that are sitting on the kitchen table!! Preheat the oven @ 180’C for about 10-12 minutes. Prepare the cake tin by greasing it with some oil and sprinkle some flour as well or line with parchment paper. While that’s happening, take the banana purée in a large mixing bowl, add nutmeg & cinnamon powders. Mix them well using a spatula. Stir in the sugar until well incorporated. Now sieve in the flours, baking powder, baking soda & the cocoa powder. Mix everything well. Now pour in the oil and the extracts. Give everything a good mix to make smooth & lump free batter. But don’t over mix it, else it’ll give you a very heavy cake/ bar (the batter will be quite thick). Pour the batter into the prepared tin and bake for about 10 minutes. Remove the tin out of the oven using a mitten (be careful for the oven will be too hot) & sprinkle the butterscotch chips/ balls on top and put the tin back in the oven ( we do this to avoid the chips from sinking and settling at the bottom). Bake for another 20 minutes approximately or until a skewer pierced in the center of the cake/ bar comes out clean. Remove from the oven and cool for 10 minutes, then invert on a cooling rack to demould the cake / bread and cool for another 15-20 minutes. Slice and serve! Preheat the oven @ 180'C for about 10-12 minutes. While that's happening, take the banana purée in a large mixing bowl, add nutmeg & cinnamon powders. Give everything a good mix to make smooth & lump free batter. But don't over mix it, else it'll give you a very heavy cake/ bar. (the batter will be quite thick). The batter will be thick, if you need to adjust the consistency, you can add some milk but then the breakfast bars won't be vegan. Omit butterscotch chips or replace it with whatever you like. We don’t consume alcohol by choice and it works for us! Some people have hinted that’s it’s boring, well if drinking yummy, pretty, healthy stuff is boring…them God help me! I want to be boring all my life! 😝 😜 LOL! Anyways, so made these again yesterday evening for the two of us..it looked nice so got clicking and planned to share it here today. It’s really simple …just mixing a few ingredients and you’re good to go. Muddle the mint leaves and lemon wedges in the mortar pestle (save some leaves n lemon slices for garnish). Crush the ice cubes in the blender but make sure it still has some ice chips / rough chunks in it. Nutella Filled Mocha Cupcakes ! But my experience with cooking was very limited when we first got married. I didn’t even know how to make a nice, round, soft Roti/ Fulkas (Indian flatbread)…let alone a proper meal (I know, I was too pampered by mom and my elder sisters) Well , that’s a shame coz every Indian girl is supposed to know that, right? But I didn’t. I had a hard time managing cooking but I was hellbent that wouldn’t hire a cook to help me out, I wanted to do it on my own. Days turned into weeks and weeks into months!! I had pulled it off!🙌🙌 💃 I managed to make full Indian meal in less than 3months into our marriage…(desserts included 👆) Mr. PP was super happy ! And me? ?What more could I have asked for?! Slowly I started to venture into unexplored territories.. Asked my mom for recipes over the phone and bought them to life. I was one happy wife! But always wanted to bake a cake for Him… So I did. 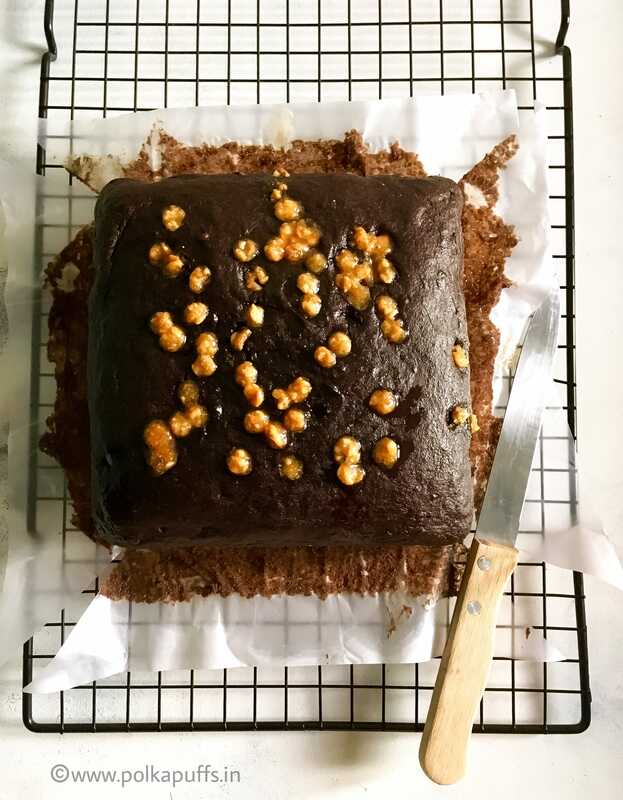 It was a basic cake and He did like it a lot… Said it was perfect for an amateur baker. I smiled , but somewhere inside me I didn’t like the sound of the word ‘amateur ‘. 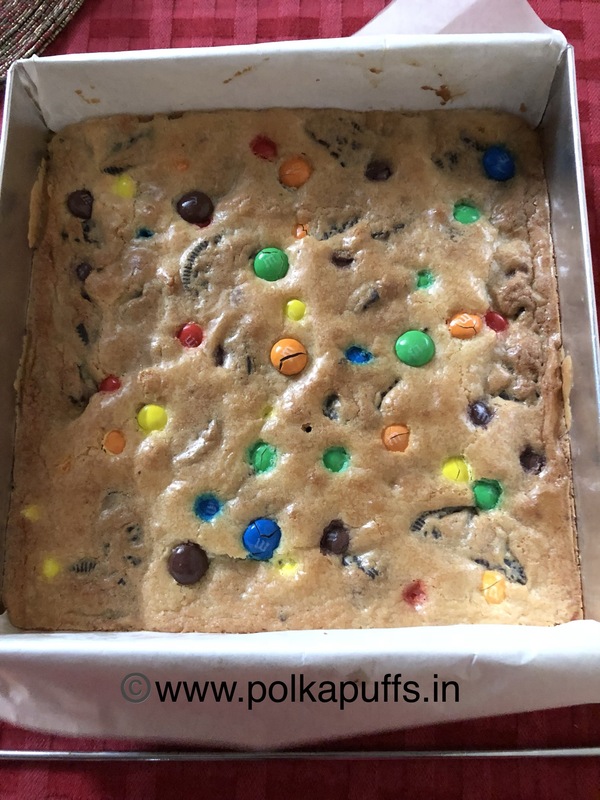 So life brings it to full circle and here I am, the ‘amateur ‘ cook /baker… With my first ever post on PolkaPuffs! 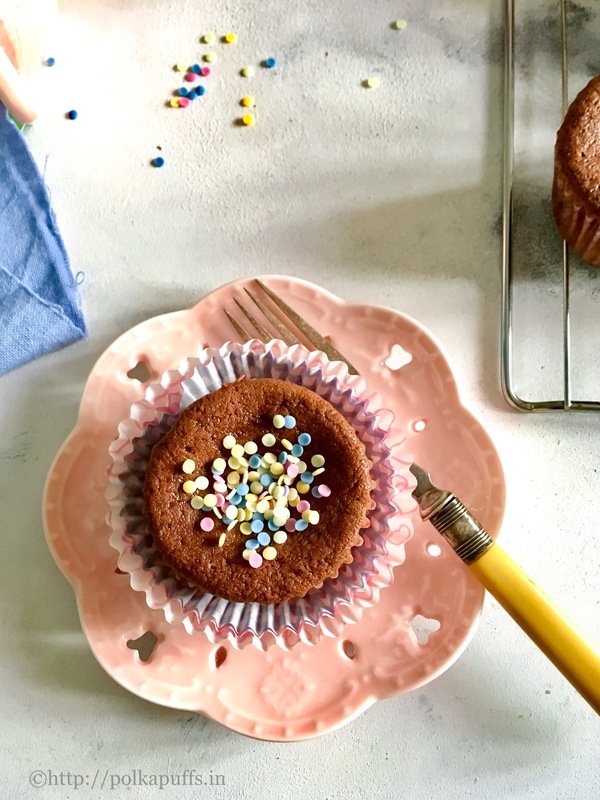 It had to be a cake… But I didn’t want to do whole cake with frosting or layers just yet, so thought of sharing my Nutella Filled Mocha Cupcakes! 😋😋😋 This is the recipe which I have been using as the base for almost all my cakes /cup cakes. It’s easy n eggless. With just an addition or two of a couple of ingredients, I end up with a whole new recipe each time! Pre heat the oven @ 180’c. Line the muffin tray with cupcake / muffin liners. In a large mixing bowl sift together flour, cocoa powder, baking soda, baking powder and salt (if using unsalted butter, I had used Amul butter so skipped it altogether). In another mixing bowl cream together the butter and sugar until light and fluffy. Add the dry sifted ingredients to the butter and sugar mix, add lemon juice, vanilla extract, mix the coffee powder with the warm water and add that too to the batter. Mix everything well but do not over mix the ingredients as that results in a heavy cake. Immediately pour 2 tbsp of the batter into the lined muffin tray in each section, add about 1 tbsp of Nutella over it carefully placing it right in the center and then again pour 1 tbsp or so of the batter to cover the Nutella. Once ready, remove the muffin tray and let it rest for 20-25 mins on the cooling rack before peeling off the liners / frosting / icing them. Decorate as you please. Keeps well in an airtight jar for 2-3 days. 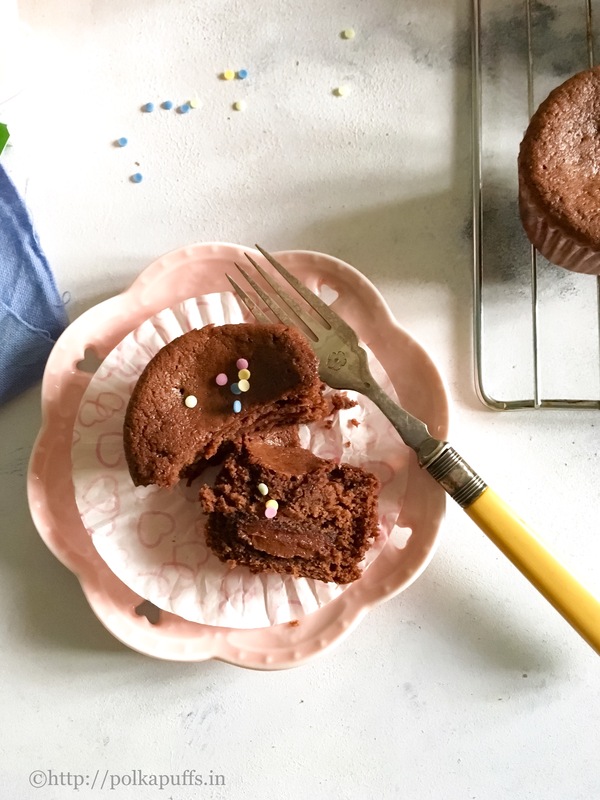 Yummy, gooey, moist egg free Nutella filled cupcakes are easy to make and easier to eat!! Pre heat the oven @ 180'c. In another mixing bowl cream together the butter n sugar until light and fluffy. Add the dry sifted ingredients to the butter and sugar mix, add lemon juice, vanilla extract, mix the coffee powder with the warm water and add that too to the batter. Mix everything well but do not over mix the ingredients as that results in a heavy cake. 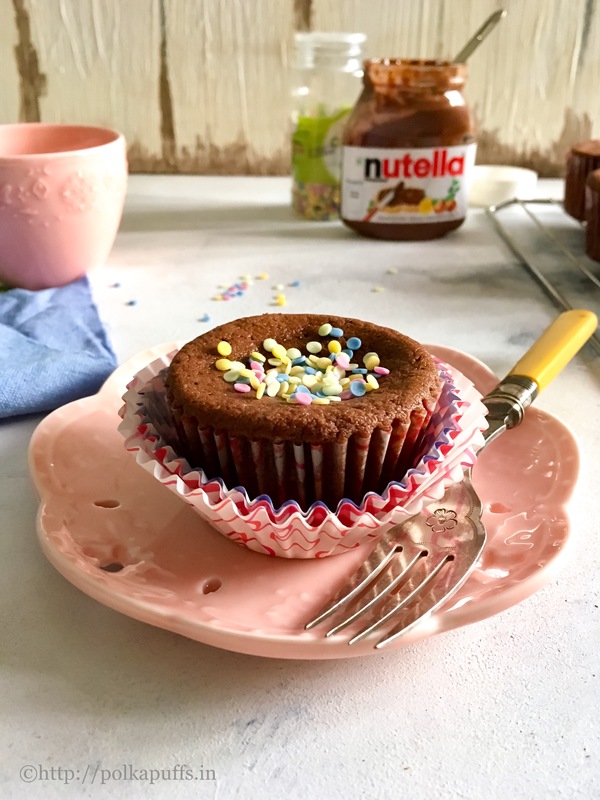 Immediately pour 2tbsp of the batter into the lined muffin tray in each section, add about 1 tbsp of Nutella over it carefully placing it right in the centre and then again pour 1 tbsp or so of the batter to cover the Nutella. Once ready, remove the muffin tray and let it rest for 20-25mins on the cooling rack before peeling off the liners / frosting / icing them.